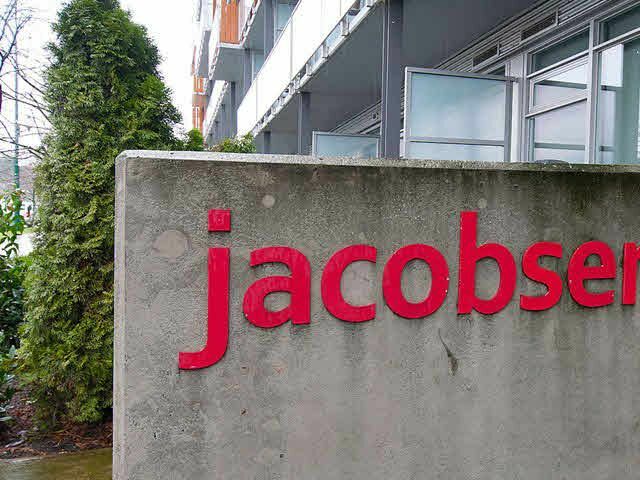 Welcome to JACOBSEN by Intracorp, designed by award winning architect Christopher Bozyk. Mountain views from bright & spacious 1 bdrm live/work home. Contemporary kitchen comes w/soft close cabinets, 9 ft ceilings, polished concrete flrs,Bosch appl, under-mount sinks, inset lighting, quartz counters, tiled backslash. Sliding glass drs open to bdrm from 2 sides, room for Queen sized furnishings. Priv Patio for BBQ's & admiring views! Ample in-suite storage, Custom Cali Closets & small den for home office or child's rm. Fitness, bike rm, wrkshp & art gallery w/kitchen. 1 parking + BONUS 2 storage lockers. Rent & Pet friendly building. Close to UrbanFare, LondonDrugs, ScienceWorld, Main St & Van seawall! Your new home awaits.